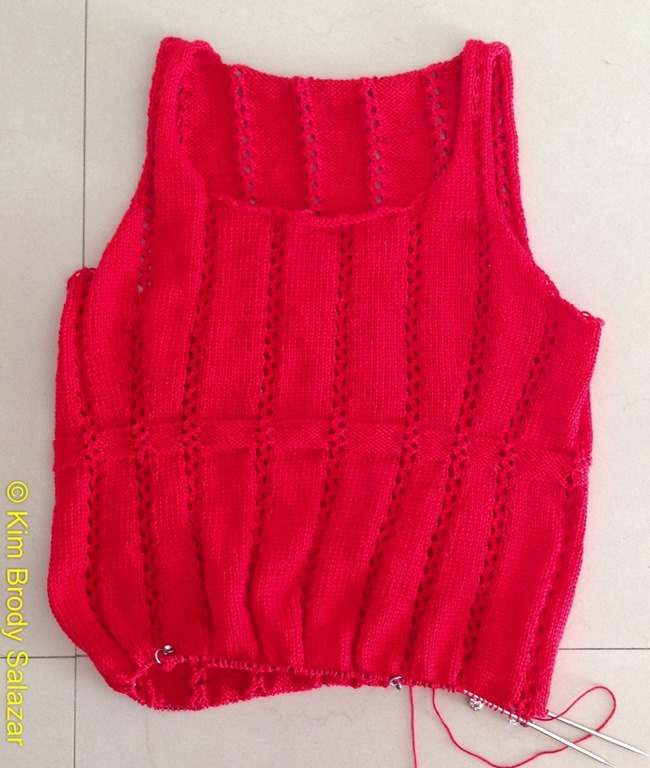 The red top-down pullover is growing at a good pace. I’m finding the Cascade Yarns UltraPima to be a very easy cotton to knit – easy to keep tension, non-splitty, and fast to work. I’m averaging about 3 inches per evening. The pattern is of the type I haven’t seen for quite a while. It’s not written for new knitters. As I warned before, if you are intimidated by things like “repeat as for left, reversing shaping,” or if you have problems calculating back to add panels of an established pattern to newly cast-on stitches, you will want to sit down with this one first, making plenty of notes and figuring out what is meant before you plunge on ahead. One extra hint – the increases and decreases in this piece happen at long intervals, for the size I’m working in one case every seven rows, in another, every 14. Keeping track of that can be a pain, but I use one of my Stupid Stitch Marker Tricks to do it. I have a marker indicating the first stitch of the round. I take a contrasting color marker, and advance it one stitch away from the first-stitch marker on each round. When seven stitches have accumulated between my first-stitch marker and my counting marker, I am ready to do my decrease. I find this method more immediate and less difficult to forget than using tally marks on paper, counting stones, or a stitch counter gizmo. But I’m past the tricky bits now. I’m into the section below the empire waist, where the “skirt” area is slowly increased to make a baby-doll A-line silhouette. Easy. The next tricky bit will be the sleeves, which I intend on making shorter than the original. On yarn consumption, I’ve just wound and tapped into Skein #3. I figure one more after this one on the body, then possibly 1.75 to 2 per sleeve. I’ve got plenty and should not have to dip into the odd-lot extra skein in my mixed dye lot bag. I’ll post more on expat life this week, once I’ve retrieved the pictures from family cameras.